When my friend Lisa told me a few years ago that she had decided to go vegan, I was devastated. She was someone that enjoyed food, all food, just as much as I did. She ate everything and really savored new food experiences. I remember one night when she and I were having dinner with another friend at Le Villaret in Paris. It was a tasting menu and we were probably on our third or fourth course. The food was exquisite, the wine superb. The three of us took a bite of what was impossibly even better than the courses that preceded it and we looked up at each other amazed. Lisa had tears in her eyes. So did I. So you get the idea. Lisa has always been one of my most precious food buddies. An indomitable eater. A loyal gustatory companion. Ok, maybe it wasn’t so dramatic. She did make this decision for valid reasons. She no longer trusted the food supply system (watching “Food Inc.” had done a number on her) and cutting out all meat products was a way for her to regain some control over what she ate. So, I took it in stride and accepted it as a new challenge: every time she visits me, I strive to “veganize” a recipe I like. Sometimes it works well (like with the pain d’épices that comes out great). Sometimes it’s tougher. For her last visit, I wanted to make some pear ice cream, since pears were in season. 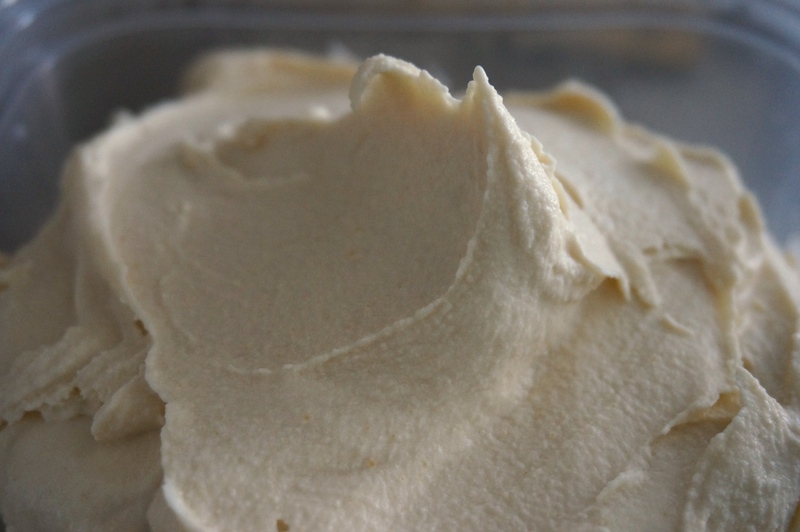 I adapted my favorite pear ice cream recipe from David Lebovitz and the result was actually pretty good. Personally, I’d much rather have it made with heavy cream, but the vegan version is still creamy, with a strong pear flavor and a slight burn from the caramel. And it made Lisa happy, which made losing the heavy cream worth it. 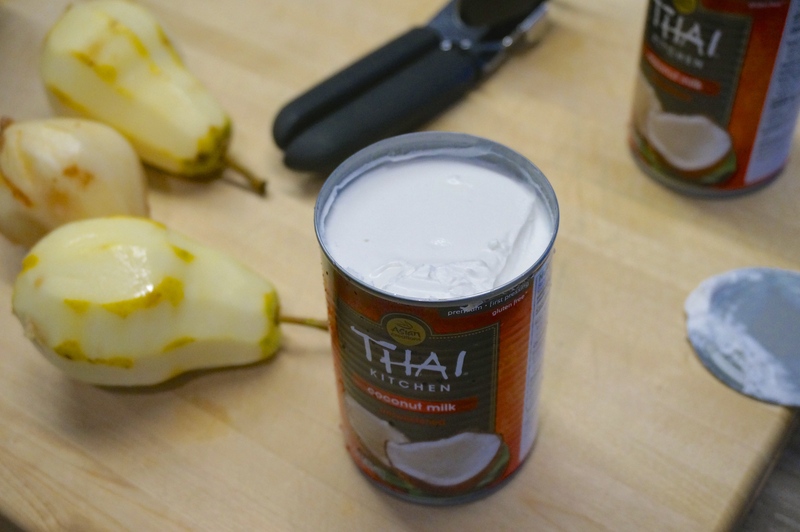 Note: The trick to this is to separate the cream from the water in the coconut milk. I used the Thai Kitchen brand of coconut milk. The cream had already separated to the top of the can. Whatever brand you use, make sure not to shake the can before opening it, other wise the cream will mix with the water. Some people refrigerate the cans first for the cream to separate. I didn’t have to but it may work for you. Using a can opener, remove the top of the two cans completely. The coconut cream should be at the top. Using a spoon remove the cream until you reach the coconut water at the bottom of the can (discard it or use it for something else, like smoothies). You should have about 2 cups of coconut cream from the two cans. Spread the sugar in a large, heavy saucepan. Cook over medium heat, carefully watching and stirring occasionally with a heatproof spatula until melted. 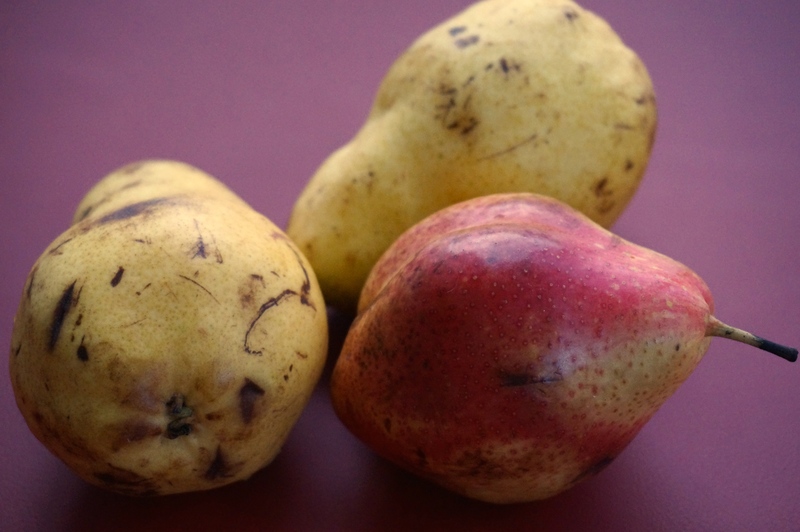 When the sugar is a deep amber, stir in the pears. The caramel will seize, but continue cooking and stirring occasionally (again with a heat-proof spatula) for about ten minutes, until the pears have cooked through and the sugar has dissolved. Remove from the heat and stir in 1/2 cup of the coconut cream, then mix in the rest of the cream, salt, lemon juice, and eau de vie/kirsch (if using). Cool to room temp, and then puree in a blender until smooth. If you want, you can press it through a strainer. I prefer that it has a little bit of the pear texture. Chill in the refrigerator and churn in ice-cream maker according to manufacturer’s instructions.